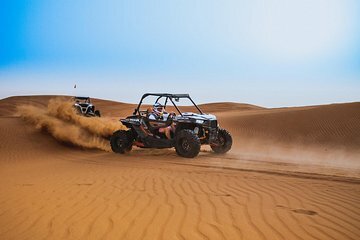 Make the most of the outdoor sports offered by Dubai’s desert with this dune buggy adventure. Prebook to secure a drive on your ideal date, and benefit from all the equipment and instruction laid on to get the very best from the experience. Then, rev up your own 2-seater 4x4 Polaris buggy and roar over the dunes behind a guide. If you wish, bring a passenger and share the driving.